Islamism is not a partisan issue. Special interests, major companies and foreign powers have long tried to affect both political parties—and the Muslim Brotherhood lobby is no different. Ten former senior officials, including a former CIA director, have issued a joint statement with meticulous documentation about how the Republican Party was and is influenced by this lobby. When the Muslim Brotherhood arrived in the U.S. in the 1960s, it recognized that violent action is counterproductive. Instead, it began political organizing so it could lead the growing Muslim-American community and use it to affect U.S. policy. In the 1980s, the FBI recruited a confidential source deep inside the U.S. Muslim Brotherhood lobby. He warned that the Brotherhood established a network of front groups including the International Institute of Islamic Thought (IIIT), Muslim Students Association, Islamic Society of North America and North American Islamic Trust. One of the chief objectives was to penetrate the U.S. government with sympathizers and IIIT already claimed success. The network was so impressive that Pakistani intelligence bred its own influence operation from it in 1990 with the Brotherhood’s support. It donated to campaigns on both sides of the political aisle and met with officials involved in foreign policy. The U.S. Muslim Brotherhood drafted a secret plan in 1991 that defined its “work in America as a kind of grand jihad…in eliminating and destroying the Western civilization from within.” It was not a doctrine of violence, but of activism based on aligning with non-Muslim political forces. It listed about 30 of “our organizations and the organizations of our friends” to accomplish it. 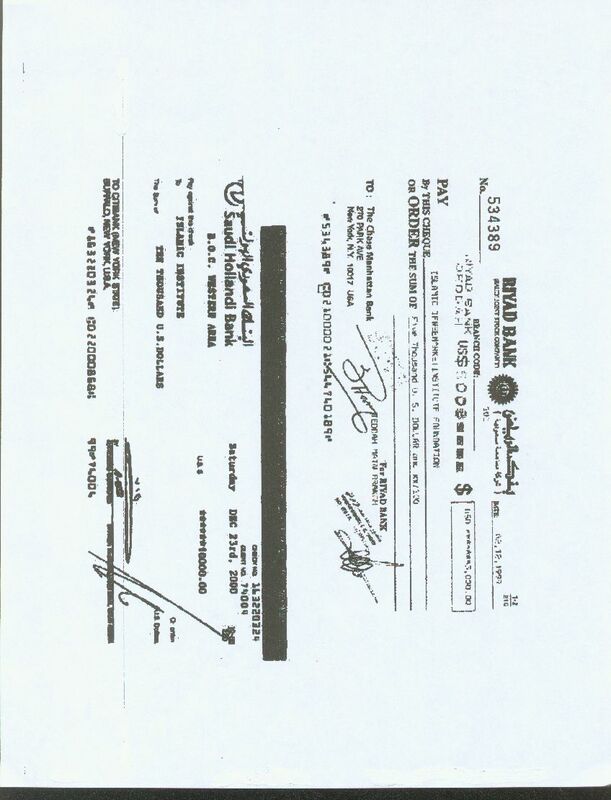 This document was recognized as authentic by the U.S. Department of Justice as was introduced as evidence in the Holy Land terror financing trial. The Brotherhood decided that a new front with an apparently clean track record was necessary. Two of the participants in that meeting founded the Council on American-Islamic Relations the following year. By 1994, the infrastructure of the Brotherhood lobby was in place, though it would continue to expand with new organizations and name changes. The most senior elements of the Brotherhood lobby handled outreach to the Clinton Administration and both political parties, especially the presidential campaign of then-Texas Governor George W. Bush. Sami al-Arian was a central figure. He admits having been a Muslim Brotherhood member from 1978 to 1982, but his involvement in the American lobby continued after that. In a 1992 letter, al-Arian acknowledged that his organization and IIIT, the aforementioned Brotherhood front, were essentially one and the same. He was convicted in 2006 of the charge of conspiring to provide services to the Palestinian Islamic Jihad (PIJ), a specially designated terrorist organization. Another central figure was Abdurrahman Alamoudi and his American Muslim Council. He developed intimidate ties to both political parties, despite his support of terrorist groups. In 2004, he was indicted on terrorism-related charges. He later wrote from his prison cell, “I am, I hope, still a member of the Muslim Brotherhood organization in the U.S.A,” as reported by the Grand Deception documentary. In 2000, Alamoudi was asked by an Islamic website how Muslims should “decrease the influence of the Zionist lobby on presidential candidates.” He said they must elect sympathetic candidates like Rep. Tom Campbell (R-CA). Rep. Campbell spoke at the Brotherhood lobby’s events and touted their causes. He became the example and was rewarded with political support and donations to his Senate campaign in 2000, including a fundraiser that brought in $35,000. The man guiding Campbell was Suhail Khan, his campaign coordinator in 1995 and press secretary and legislative assistant from 1996 to 1999. Khan’s father was a bit of a legend in the Brotherhood lobby, as one of the original founders of the MSA and ISNA. It is well-documented that the early establishers of these groups were part of a Brotherhood campaign. He also established an Islamist mosque in California that would later host the “Blind Sheikh” involved in the 1993 World Trade Center bombing and have Muzzamil Siddiqi, former president of ISNA, as its imam. Khan’s mother helped CAIR set up operations in her state, serving as a member of the Executive Board of CAIR-California (CAIR is a Muslim Brotherhood entity that was listed as an unindicted co-conspirator in the Holy Land terror financing case by the Department of Justice). Khan mentioned specific battlefields where Muslims must unite to defeat the “oppressors” of Islam: Palestine, Bosnia, Iraq and Kashmir. He also told Muslims that they were under siege in America from the government and society and claimed that harassment was commonplace and that mosques and Islamic centers being burned and desecrated. Two years before 9/11, Khan and the Brotherhood lobby were already using their “Islamophobia” strategy. One of the major issues that Al-Arian, Alamoudi, Khan and the Brotherhood network fought for was freedom for al-Arian’s brother-in-law, who was arrested in 1997 on terrorism-related charges and detained indefinitely based on undisclosed evidence. Enter Grover Norquist. Norquist encouraged the Republican Party to take up the cause. GOP Rep. Campbell was one of the first to join in, going so far as to visit Al-Arian’s relative in jail. They began intensively lobbying to end the use of secret evidence to detain non-citizens, thereby freeing him and stopping his deportation. The Clinton Administration was not receptive, so the Brotherhood lobby looked to its rival political party. In 1996, President Clinton won the Muslim-American vote, a growing minority that the Republican Party saw as an opportunity. Two years later, Alamoudi dispatched his closest aide, Khaled Saffuri, to team up with an extremely influential Republican activist named Grover Norquist to form the Islamic Free Market Institute. He has been called the “most powerful man in America” because of his ability to make Republican congressmen and candidates bend to his anti-tax platform. Suhail Khan also joined as chairman and a board member. Saffuri had personal ties of his own to the Brotherhood lobby beyond Alamoudi. He has worked with Jamal Barzinji, one of the main founders of the network, since 1988. The FBI’s source around that time mentioned Barzinji by name as a Muslim Brotherhood operative trying to influence U.S. policy. The Brotherhood lobby instantly rallied behind the Norquist-Saffuri initiative to create the Islamic Free Market Institute. 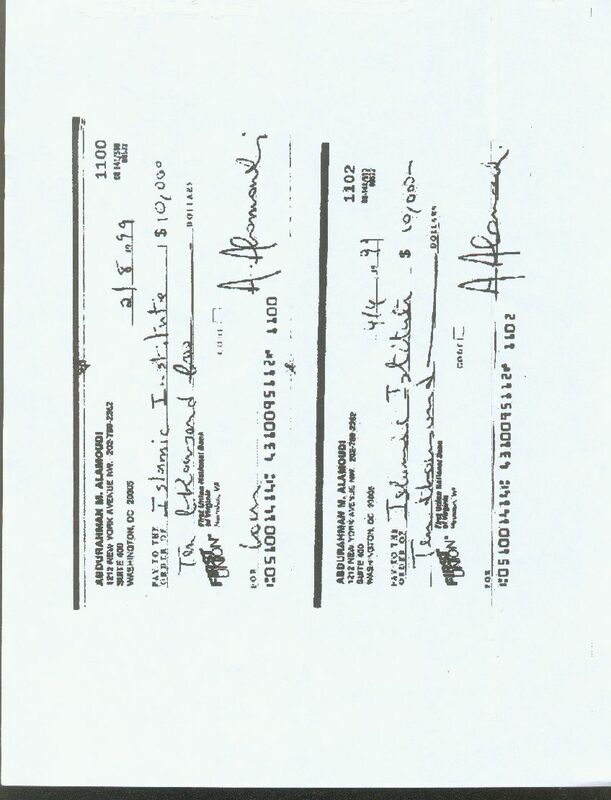 Alamoudi provided two payments of $10,000 to the institute in 1999. 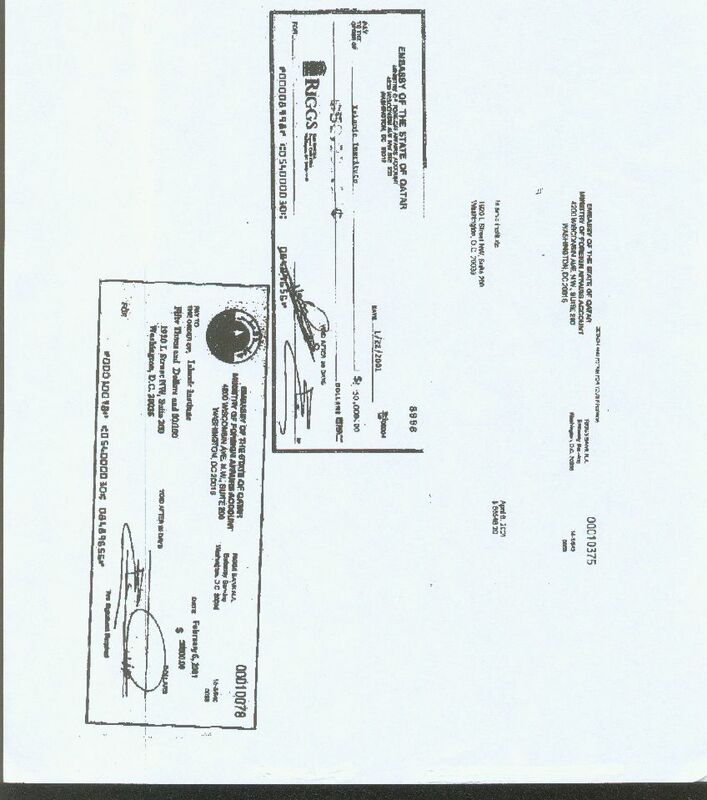 In addition, he paid a total of $50,000 in 2000 and 2001 to a Norquist-linked lobbying firm. 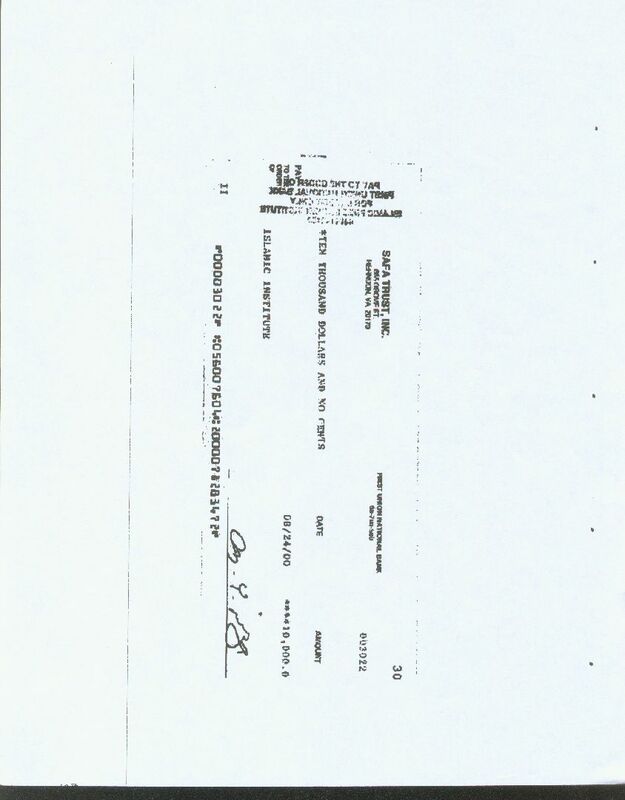 The Safa Trust, a component of the Brotherhood network whose offices were raided after 9/11, provided $35,000 (Author Paul Sperry has a copy of one $10,000 check from 2000 here). 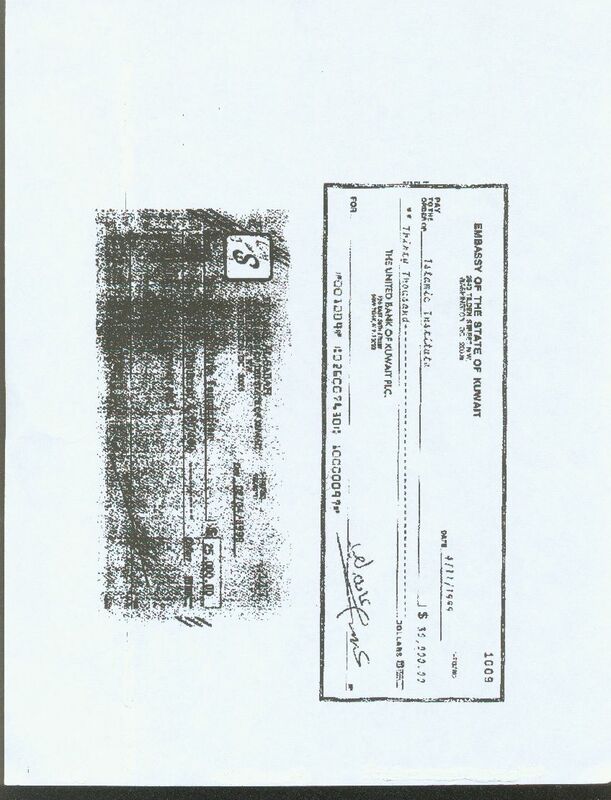 Barzinji’s IIIT gave $11,000. In addition, at least $15,000 came from Saudi sources in 1999 and 2000, $30,000 from the Kuwaiti government in 1999 and $100,000 in 2001 from the Qatari government, one of the Brotherhood’s largest state sponsors. The effect on the GOP was immediate. Norquist’s Islamic Free Market Institute scored an endorsement from Republican National Committee chairman Jim Nicholson. GOP officials began meeting with the Institute, Alamoudi’s American Muslim Council and other Brotherhood entities. Texas Governor George W. Bush announced his presidential campaign in June 1999 and his campaign reached out to Norquist. The lobby became intimately involved in its Muslim outreach and Saffuri became its national advisor on Arab and Muslim Affairs. In January 2000, Bush met with Islamist Imam Hasan Qazwini. In March, Bush met with Sami al-Arian. In May 2000, Bush’s picture was taken with Alamoudi and Saffuri during a meeting at the Governor’s mansion in Texas that included Saffuri. Bush adopted their position against the use of secret evidence, calling it a form of “racial profiling” against Arabs during the second presidential debate. The Bush campaign’s efforts to win Muslim support by adopting the lobby’s positions were open and aggressive. Bush publicly touted al-Arian’s main cause. Talat Othman, then chairman of the Norquist/Saffuri group, gave the invocation at the Republican National Convention. There is contradictory information about the impact this outreach had on the Muslim vote, but it’s generally agreed that it produced significant results. CAIR’s polls showed that Bush’s share of the Muslim vote was 28% in July 2000 and grew to 40% in mid-October. Gore’s share fell from 33% to 24%, while Nader’s increased from 5% to 20%, possibly due to anger at Gore for choosing the staunchly pro-Israel Senator Joe Lieberman as his running mate. After the election, CAIR said that 72% voted for Bush, 19% for Nader and 8% for Gore. Another organization, the American Muslim Alliance, said over 80% went to Bush. Norquist and the Brotherhood lobby boasted that their Muslim outreach had swung the state of Florida for Bush. “Bush was elected President of the United States of America because of the Muslim vote,” Norquist said. The lobby’s access to Bush’s inner circle continued after he took office. Suhail Khan was given a position in the Office of Public Liaison and managed the White House’s interfaith relationships. Three officials from the Muslim Public Affairs Council including Mahdi Bray. Dr. Syed Fai from the Kashmiri-American Council, who was later convicted of being a Pakistani ISI spy. His group was a central component of the Brotherhood-linked Pakistani lobby. Taha al-Alwani from the Saudi-backed Graduate School of Islamic and Social Sciences that was raided in 2002 and labeled an unindicted co-conspirator in Al-Arian’s trial. Susan Douglass, a teacher at a Virginia school linked to the Saudi government that came under heavy criticism for promoting extremism. An official from the Brotherhood/Hamas-linked Dar al-Hijrah Islamic Center. 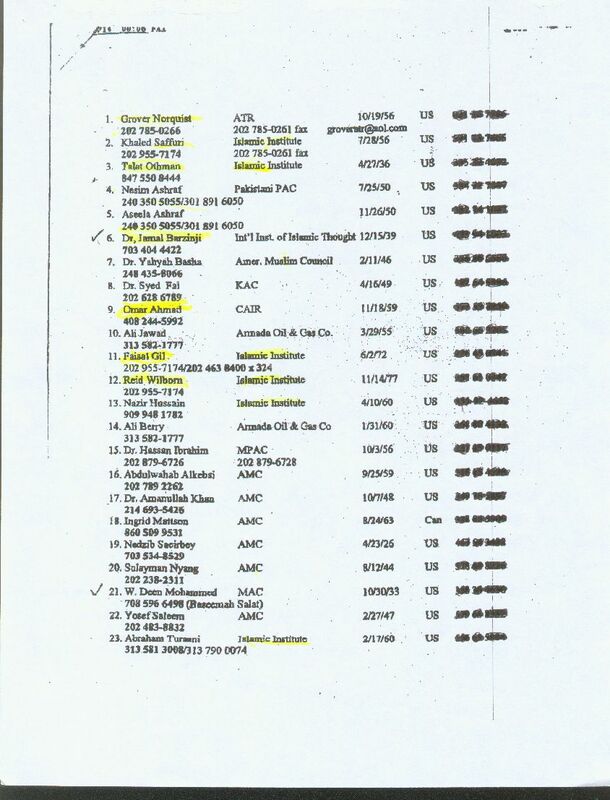 In June 2001, Alamoudi’s American Muslim Council was given a briefing by Karl Rove and al-Arian was among the invitees. Al-Arian also visited the White House that month. In July, al-Arian honored Norquist with an award, crediting him with convincing President Bush to oppose the use of secret evidence. By that time, the lobby had grown impatient. In September 2001, shortly before the 9/11 attacks, al-Arian spoke at an ISNA conference and urged the audience to overwhelm the White House with demands that Bush follow through on his campaign promise to stop the use of secret evidence in immigration courts. It worked. The Brotherhood lobby’s meeting with President Bush was scheduled for September 11, 2001. Frank Gaffney, President of the Center for Security Policy, shared office space with Norquist when the 9/11 attacks happened. When the lobby’s meeting with Bush was cancelled, it was there that they reconvened at. Gaffney and his colleague, national security expert Dr. J. Michael Waller, saw Norquist, Khan and their colleagues enter the building. Waller, located next door to the meeting room, was able to listen in on their conversation. Waller says he heard them discussing how to posture themselves after the attacks. Some of the participants felt uncomfortable condemning the attack on the Pentagon because they viewed it as a legitimate military target. The group decided to vaguely condemn the attacks in a way that would not offend the American public or violate their Islamist sensibilities. After the 9/11 attacks, the Bush Administration realized it needed to put moderate Muslim voices out front that would discredit the terrorist propaganda that the U.S. was waging a war on Islam, as well as limit any backlash against patriotic Muslims. On September 17, Bush spoke at the Islamic Center of Washington after meeting with Muslim leaders. One of the “moderate” Muslim leaders standing to Bush’s left was Nihad Awad, executive-director of CAIR. To his right, was Saffuri. On September 26, Bush sat next to Muzammil Siddiqi, former ISNA president, as he addressed the press. Bush praised Siddiqi for leading a September 14 prayer service at the National Cathedral and upheld him as one of the moderate Muslim leaders the U.S. must support. “He [Siddiqi] did a heck of a good job, and we were proud to have him there. And I want to thank you very much for the gift you gave me, Imam, the Koran. It’s a very thoughtful gift,” Bush said. Unbeknownst to Bush, Siddiqi preached that Muslims should implement Sharia in the U.S. using the Brotherhood doctrine of “gradualism.” He taught that participation in the democratic process was a means to this end. In October, Attorney General John Ashcroft met with a group of Muslim leaders that included Mahdi Bray of MPAC. Bray has an exceptionally strong history of extremist rhetoric. In 2000, Bray was on stage with Alamoudi and gestured his approval when he praised the terrorist groups Hamas and Hezbollah. In 2008, Bray went to Egypt to express his solidarity with the Muslim Brotherhood. President Bush’s senior political advisor, Karl Rove, would later admit that he had not known of the extremist backgrounds of those Bush had embraced. It is highly unlikely that Norquist and Khan were unaware. It is probable that their endorsements explain why the Islamists slipped in under the radar. Another problem was the security clearance process and the administration’s flawed view of the Brotherhood. The Brotherhood was not and is not listed as a Foreign Terrorist Organization. Sympathy for the Islamist group, or even having a direct connection, does not disqualify someone from serving in an official capacity. that the largest outside investigator for government security clearances, is accused of intentionally sending the government 650,000 incomplete background checks since 1996. The honeymoon between the Bush Administration and the Brotherhood lobby did not last long. President Bush never delivered on taking actions that would free al-Arian’s brother-in-law. Sami al-Arian himself would go to jail for being a secret Palestinian Islamic Jihad leader. The Brotherhood lobby still, to this day, maintains his innocence and asserts that he is jailed simply for being Muslim. These apparently separate organizations demonstrated their unity as a single lobby whenever one of them came under investigation. In each case, they’d simultaneously use their megaphones to claim they were victims of anti-Muslim persecution by the U.S. government. The “War on Terror” was presented as a “War on Islam.” The very partners that the Bush Administration chose to battle this narrative advanced it instead. They tried to use Norquist to put an end to the crackdown. He organized a meeting between Saffuri, Othman and Treasury Secretary Paul O’Neil, whose position gave him a leading role in the terrorism-financing investigations into IIIT and the other Brotherhood lobby components. They protested the government’s actions to no avail. In July 2002, Gaffney saw Al-Arian and Norquist again meeting in the office space. It is not known what they discussed. The propaganda machine of the Brotherhood lobby went into overdrive, especially furious at the closing of the Holy Land Foundation for financing Hamas. CAIR projected that 80% of Muslim-Americans would vote for Kerry in the 2004 presidential election. After the vote took place, CAIR changed its estimates. It claimed that 93% voted for Kerry, 5% voted for Nader and less than 1% voted for Bush. Nonetheless, Norquist remained a powerhouse influence in the Republican Party, even though he and his Islamist allies did nothing to combat the damaging rhetoric from the Brotherhood lobby. His Muslim wife, Samah, served the U.S. Agency for International Development as Senior Advisor for Arab and Muslim Outreach. His brother, David, became the chief financial officer of the Department of Homeland Security in 2006. Norquist’s close associate, David Hossein Safavian, was also treated well after 9/11. In 1997, he formed a lobbying company named Janus-Marritt Strategies with Norquist and later served as a director for Norquist’s Islamic Free Market Institute. 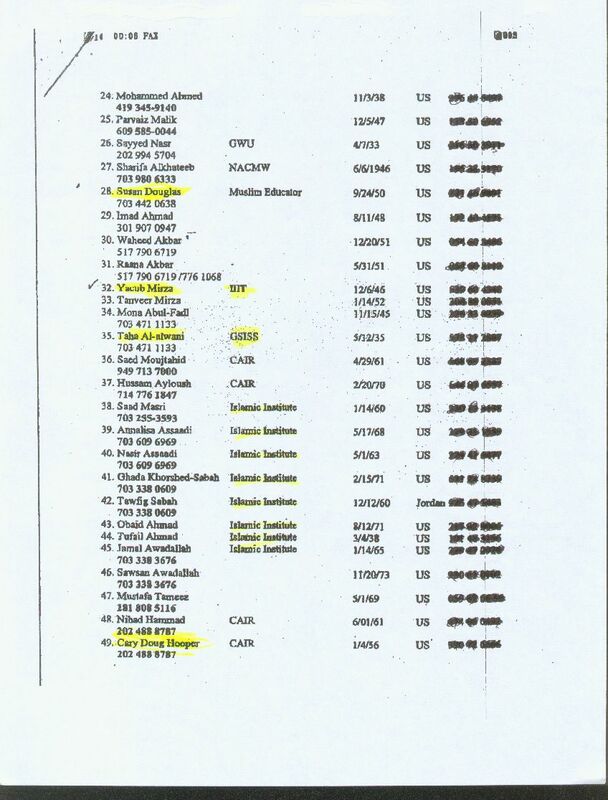 Their lobbying firm was even hired by Alamoudi in 2000-2001 and, after Safavian left, Barzinji of IIIT. In May 2002, Safavian was appointed to Senior Advisor and Acting Deputy Chief of Staff for the U.S. government’s General Services Administration. In November 2003, he was nominated to a top position in the Office of Management and Budget as the Administrator for Federal Procurement Policy. Safavian was later indicted in 2005 as part of the corruption investigation into Republican lobbyist Jack Abramoff. In 2009, he was sentenced to a year in prison. Khan was moved from the Office of Public Liaison to the Transportation Department as the Assistant to the Secretary for Policy. Karl Rove, President Bush’s most trusted political advisor, dismissed concerns about Norquist in 2003 despite his admitted ignorance of the Brotherhood lobby in 2001. The Brotherhood lobby’s influence reached new heights under the Obama Administration, capitalizing on the ground it gained under the Bush Administration. Norquist and Khan still work with the Brotherhood lobby, despite immense documentation of its extremism. They are unconcerned with the U.S. government’s labeling of three major groups—CAIR, ISNA and NAIT—as U.S. Muslim Brotherhood entities and unindicted co-conspirators in the Holy Land Foundation trial. Khan is chairman of the Conservative Inclusion Coalition. He is a board member of the American Conservative Union that sponsors the Conservative Political Action Conference, the largest annual gathering of conservatives in the nation where he often is a speaker. In 2011, he told a CPAC audience that the Muslim Brotherhood does not even exist in the U.S. He defends ISNA and denies that it is a Brotherhood front, despite the fact that the Department of Justice recognized it as such. He similarly denies that his father was involved with the Brotherhood in any way. He also denies any connection to Alamoudi. Norquist, his wife and Khan came out swinging against conservatives that opposed the Ground Zero Mosque project. They described it as an attack on Muslims and warned that the GOP would lose all support from minority voters if it continued. In 2011, Norquist even spoke at a Michigan event that branded the Brotherhood lobby’s critics as anti-Muslim bigots belonging to an “Islamophobia” industry. Also speaking at the event was Dawud Walid, the executive-director of CAIR-Michigan. The Republican Party remains largely neutralized, with none of the leading presidential contenders for 2016 showing any sign of knowledge about the Brotherhood lobby. In fact, N.J. Governor Chris Christie is earning the praises of CAIR and is shockingly close to Islamists involved with the Brotherhood lobby, going so far as to defend one from deportation by the Department of Homeland Security. He reacts to criticism on this issue with angry defensiveness, blasting those that mention it as anti-Muslim bigots. Former GOP presidential nominee Senator John McCain and his close friend, Senator Lindsey Graham, once viewed the Muslim Brotherhood as adversaries. Now they view it as a partner and pushed the Obama Administration into retaliating against Egypt for overthrowing the Brotherhood’s rule. The best example of the power of the Brotherhood lobby’s political warfare is what happened when five Republican members of Congress brought attention to its influence on parts of the U.S. government in 2012. They were hit with a tidal wave of negative press coverage, much of it due to fellow Republicans. They were harshly blasted by Republican officials like McCain, possible presidential candidate Florida Senator Marco Rubio, House Speaker John Boehner, then-Senator Scott Brown, Arizona Rep. Jeff Flake and Wisconsin Rep. Jim Sensenbrenner. The evidence presented here of Islamist Muslim Brotherhood influence at the highest ranks of the Republican party’s apparatus is overwhelming. Separate research should be conducted to evaluate the level of Islamist influence in the Democratic party. Islamist infiltration into American political parties should be a bi-partisan concern, since the Islamist ideology is anti-democratic and its ultimate goal is to replace the American Constitution with Islamic sharia law. It’s hard to conceive of a more bi-partisan issue than that.